For intimate parties and gatherings a classical guitar brings an air of refinement and class to any setting. Gentle tones and arpeggios help fill the space with music that encourages conversation. Never overwhelming or deafening, the classical guitar lays down the perfect audio background that will encourage your guests to interact with those around them. Whether a hotel, a home, or other setting, a classical brings the ultimate gentle, soothing sounds to your event. For weddings and other seated gatherings classical guitar music adds a regal feel to the time, helping your guests feel as important as they are to you. Light, airy, and never intrusive, a guitar will set the tone for the event. Combined with a flute, cello, or violin for larger halls, the effect can be equally as mesmerizing. 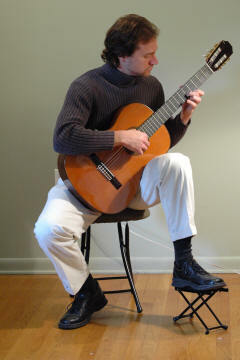 A classical guitar can be used to support any part of an event. Candle lighting, vows, prayers, and other traditional wedding elements are supported beautifully by guitar music. Quiet, sensitive, and angelic, guitar music never gets in the way of the experience. It instead blends seamlessly and invisibly into the memories of all who are present. A classical guitar is a beautiful instrument. Elegant woods blend perfectly into any event location. So are you ready? Hiring a guitarist is very easy. Please watch my new video on the benefits of music instruction. Please visit my page dedicated to wedding performances. Read thank you notes. Watch a fun video from a recent wedding! Please visit our calendar to find out where I am playing each week then join for a great time!